Investors at a petroleum symposium in Calgary Monday were challenged to taste water taken from Lake Athabasca in northern Alberta. 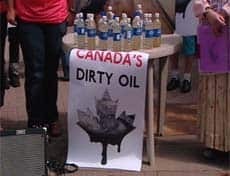 (CBC)Oilsands protesters challenged investors at a Calgary petroleum conference on Monday to drink from bottles of murky water from Lake Athabasca, which sits near Alberta’s major oilsands developments. Environmentalists joined residents from the Fort Chipewyan area in northern Alberta at the annual symposium of the Canadian Association of Petroleum Producers to ask the oil and gas industry to slow down development long enough to fully study the water supply downstream from oilsands projects. The protesters also wanted to attract the attention of hundreds of investors at the symposium. “Our kids, my children, they swim in that water. They drink that water every day. They drink it and we drink it out of our taps, so if it’s safe, they should be able to take a drink of it too,” Lionel Lepine, a member of the 1,500-member Athabasca Fort Chipewyan First Nation, told CBC News outside the downtown meeting. 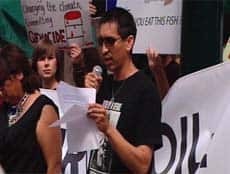 Lionel Lepine speaks at a demonstration against oilsands development outside a Calgary petroleum symposium Monday. (CBC)Lepine said he’s lost several friends to cancer and that other friends and family are living with the disease. “Who’s to blame? I don’t know. But … I bet my life it’s coming from the tarsands,” he said. After years of complaints about high rates of cancers and other illnesses in Fort Chipewyan, the Alberta and federal governments announced in May that they were launching a thorough review of health concerns in the region. “These projects keep happening. That means nobody is listening, so I’m here to get the message across that you’re killing us. We’re dying,” said Lepine. Protester Leah Henderson of Forest Ethics said they want to let the investor and financial communities know that there’s a risk in the petroleum projects they back. Ross Levin, right, an investment analyst, took time to hear protesters’ arguments outside a downtown Calgary meeting. (CBC)“They don’t want to be investing in the destruction of life on earth as we know it,” Henderson said. Ross Levin, an investment analyst from New York, spoke to the protesters about their water challenge but declined to take a sip. “I think that there are always environmental costs to any type of, sort of, natural-resource extraction, whether you’re cutting down a tree or pulling oil out of the tarsands, and there’s always going to be some kind of balance struck. We may argue about where the proper line ought to be drawn,” he said. Pierre Alvarez, president of CAPP, said oilsands companies are responding to the environmental concerns as projects move forward. “Sustainability reports are being submitted on an annual basis, so they’re not just reporting on financial results, we’re reporting on environmental results, and investors know that,” he said. This entry was posted on June 17, 2008 at 1:32 am	and is filed under Uncategorized. Tagged: alberta, alberta government, capp symposium, climate change, forest ethics, fort chipewyan, greenhouse gas emissions, greenpeace, investment, investors, lionel lepine, securities, sierra club, tar sands oil sands. You can follow any responses to this entry through the RSS 2.0 feed. You can leave a response, or trackback from your own site.